Reuse and recycling starts with you! Do you own one of the 1.6 billion unused phones shoved into the far corners of drawers and closets? 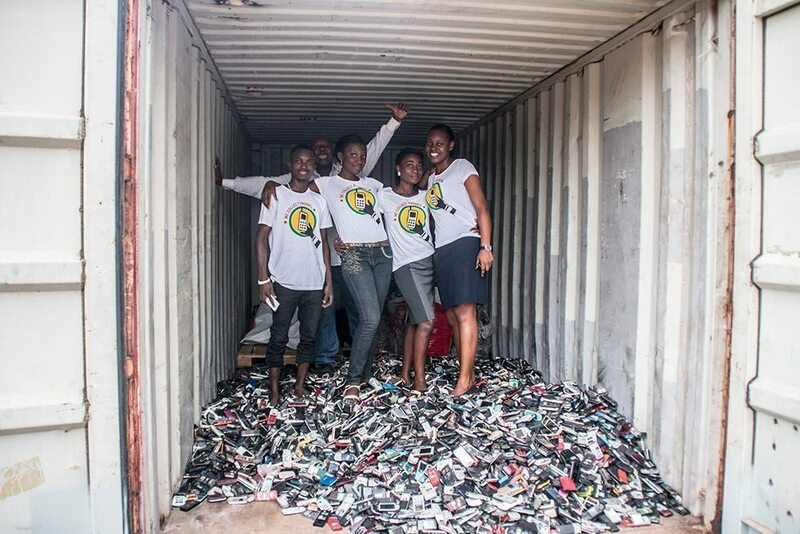 These forgotten mobile phones are packed with valuable materials that can be used again and again. So dig them out and start recycling! Get a free shipping label below and send us your previous mobile phone(s). If it's old / heavily damaged we'll recommend you local options for reselling, donating or recycling your phone. Send me a label that I can use to send them my previous mobile phone(s) for free. Our DEKRA-certified partner removes all personal data from your phone. For peace of mind, you may wish to delete the data yourself before sending in your phone. Recycling your phone is a great way to show you care about fairer electronics. Any revenue we receive from your old phones we use to support this recycling program and all our other social and environmental projects. Note: This program is only for complete phones. If you want to return a module, go back to the top and select “Fairphone modules”. Gather your phone and any accessories you can find. Wrap the phone and accessories securely in tissue paper or bubble wrap. Place everything in a sturdy box (a shoebox or the original product box should do). If necessary, add more newspaper or bubble wrap to keep things from sliding around. Print attached shipping label and tape it to your box. That’s it! Thanks for supporting safe recycling and helping Fairphone extend the lifespan of mobile phones. Based on the specifications of your phone, it appears that the cost of shipping is greater than the value that the phone would bring to our recycling program. So we recommend that you recycle your phone locally. At the right, you’ll see some suggested options for selling or donating your phone for safe recycling. Besides these options, most electronics and mobile phone stores have a free recycling drop-off point. However, if you can’t find any suitable options where you live, we will still accept your old phone for our recycling program. *Except for Closing the Loop, we have no direct ties to the companies mentioned above. Please be sure to carefully read the terms and conditions on each website before sending in or dropping off your phone. If you know of any other companies or recycling points that you think we should include on our list, please contact us. In late 2017, we kicked off a pilot to recover Fairphone modules with two main goals: explore the benefits of modularity for recyclability, and inform future product development by analyzing module repairability. Fairphone 2 users have sent mostly camera, top, and bottom modules from several countries (mainly Germany, the Netherlands, UK and France). This pilot isn’t running anymore, we’re now exploring its possibilities for the future. However, this doesn’t mean you can’t recycle your modules! You can still do so locally, most municipalities have ways to collect and treat e-waste. Consult their website for more information.